Focus Label Machinery Ltd was formed in 1981, with over 30 years of previous experience in manufacturing equipment for the narrow web label & Packaging print industry. This experience has enabled us to become market leaders in our industry and over the years our international presence has grown with us now exporting our products across all continents. Focus covers a range of sectors from Food Packing & Labelling, Chemicals, to Textiles, Garments & branding identification. We are able to provide equipment for mainstream production as well as for more bespoke applications; we aim to provide our customers with top quality machinery and top quality service. Technical support for our equipment is delivered through carefully selected Focus trained Technicians & local representatives. Their heritage continues to deliver the latest technical advances through research, development and thinking outside the box. 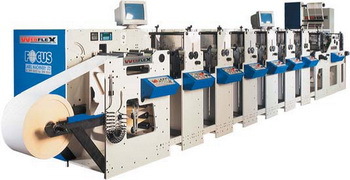 These compact ranges of machines are Central Impression Flexographic machines, supplied with IR or UV drying systems. 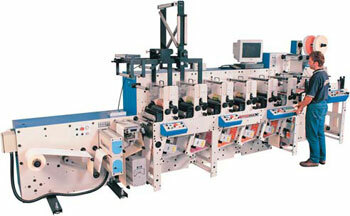 The layout makes the equipment suitable for Packaging, Flexible Films, Papers, Meat Casings as well as Label & Tickets. Where high print quality on demanding substrates are a priority the Centraflex makes the perfect choice. The Proflex range of modular printing press equipment are available with line shaft or Servo drive technology. We have a wide range of options for specialised production applications. Combination drying systems for labels, tickets & board, including chill rolls for unsupported films make the Proflex range the right choice for narrow web printing at a sensible investment level. Modular 2 to 10 colours construction. The Webflex range of modular printing press equipment is supplied with up to 10 colours for heavy duty production application such as tickets, small cartons & board. You have two web sizes to choose from; 330mm & 430mm, as well as a wide range of options for specialised production applications. The combination drying systems of Infrared & UV with chill rolls technology puts the Webflex ahead of the competition. Modular 4 to 12 colours.